Members of the football team weren’t the only Penn State students participating in a bowl game over winter break. Two undergrads spent portions of their breaks interning at postseason games. 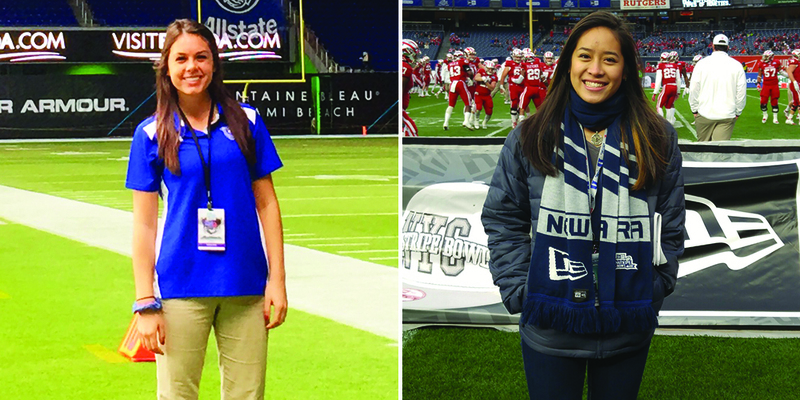 Senior Erica Avallone, a native of Somers Point, New Jersey, served as a media relations volunteer for the Miami Beach Bowl, while sophomore Jaime Chan (photo, right), who is from West Chester, Pennsylvania, was a hospitality management intern for the Pinstripe Bowl. Avallone’s father and grandparents live in the Miami area, making it a logical place for her to go because she already had a place to stay. She wasted no time getting to work over break, hopping directly on a plane following her last final exam of the fall semester. Serving as the media relations liaison for USF, which took on Western Kentucky on Dec. 21, Avallone also compiled the game notes for the contest, creating them from scratch. She worked for five days straight, putting in 10-12 hour days, attending practices and events. The tasks were nothing new for Avallone, who interns in the Penn State Athletics strategic communications office and hopes to pursue a career in sports media relations following graduation. Avallone, who has spent numerous game days in Beaver Stadium, tabbed being in Marlins Park as her favorite part of the trip. Chan, who stayed with an aunt in New York, also attended a game in a baseball venue, with the Pinstripe Bowl taking place in Yankee Stadium. Duke faced off with Indiana on Dec. 26. Chan spent the majority of the week with the Duke team, making sure they had everything they needed, escorting them to events and answering any questions they may have. Chan said the position took a lot of organization and coordination. Communication was key to making sure the week’s events ran smoothly. On game day, Chan escorted the Duke cheer squad on and off the field. While it wasn’t necessarily a communications internship, Chan, who intends to be a film-video major at Penn State, still took a lot of useful skills away from the trip.